… And its name is “Sculptris“! Oh man, I still can’t believe what a wonderful tools this is. I’ve tried to do some sculpting exactly once before, using Mudbox (I just couldn’t be bothered to live by Zbrush’s twisted sense of humor). But I never caught on. Just not immediate enough. Too much pre-planning work if you don’t want to corner yourself later on. Not very glamorous. But this program (Sculptris) is an entirely new thing: you start from a sphere and you just sculpt. That’s it. The interface is extremely simple and you can do anything you want. No Zplugin or Zsphere or topologically correct mesh made in another 3D application before-hand. What makes Sculptris so special is that it uses “dynamic tessellation”. It basically means that you can sculpt exactly as you want, you’ll never end up with a mesh too heavy because it has been entirely subdivided too many times. Nope, you just use the “Reduce Brush” and paint away on the wireframe to simplify some areas while keeping the localized detail where it needs to stay. And while you paint minute details, Sculptris subdivides the mesh on the fly, but just where you work, not the whole thing! It’s absolutely transparent to the user. And did I mention it’s free? Regardless, I made a donation to the author. Pixologic (the makers of Zbrush) seem to have realized that this program could become a little dangerous for their flag product and they decided to hire the programmer (his name is Tomas Pettersson). If they want to integrate dynamic tessellation into Zbrush, the more power to them; I just hope they don’t stall the development of that little jewel. So anyway, yesterday I started from a sphere and ended up with… something different. Fun to see we juste tried our hands on Sculptris at the same time. 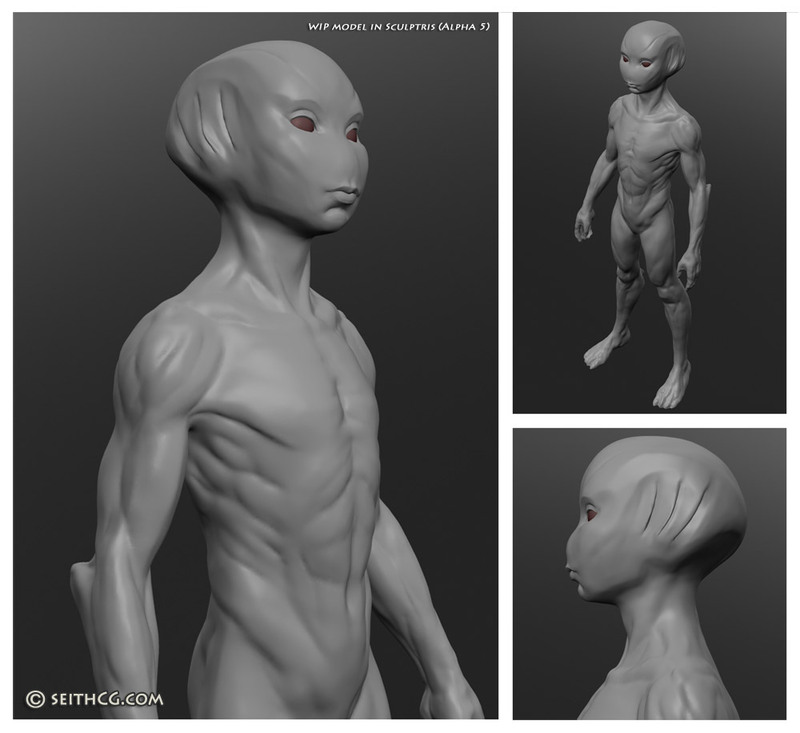 I had never tried the big products like Mudbox or Zbrush, feared before even starting, because of the workflow. I’m not that much of a modeler, nor a sculptor, but I enjoyed it so much!!! Will manage to make a donation too, the work done by this guy is so amazing. Simple, intuitive, snappy interface, quite predictible results… I had a such a blast creating a head from scratch, that I will do some more for sure. How much work to get it rigging ready? Wires!